Shark Bay, covering 23,000 square kilometres, is an area of major zoological importance and home to about 10,000 dugongs (sea cows) and many dolphins. The area supports 26 threatened Australian mammal species, over 230 species of bird, and nearly 150 species of reptile. It is an important breeding and nursery ground for fishes, crustaceans, and coelenterates. There are 323 fish species, with many sharks and rays. Shark Bay also has the largest known area of seagrass, with seagrass meadows covering over 4000 km2 of the bay. It includes the 1030 km2 Wooramel Seagrass Bank, the largest seagrass bank in the world. Shark Bay also contains the largest number of seagrass species ever recorded in one place; twelve species have been found, with up to nine occurring together in some places. 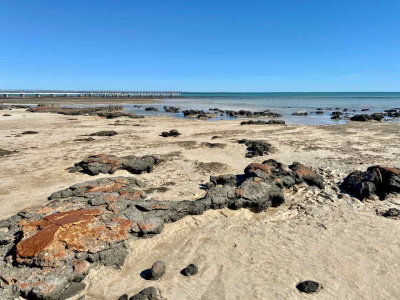 At Hamelin Pool in the south of the bay, living microbes are building stromatolites that are over 3000 years old. The Hamelin Pool contains the most diverse and abundant examples of stromatolite forms in the world. Travelled to Shark Bay on a 4WD backpackers tour up the west coast of Western Australia from Perth to Coral Bay in April 2002. The most publicised aspect of Shark Bay is the Dolphin feeding at Monkey Mia however I found it personally dissapointing. The half hour "show" involves three rather domesticated dolphins. Much rather see dolphins in the wild. Some of the coastline contrasts dry red and ochre cliffs with turquoise blue waters. A good place to stay is at the camping ground at Nanga on the freycinet Peninsula. Lagoons: Shark Bay's "attractions are also supplemented by secondary features such as Shell Beach, Big Lagoon and the Zuytdorp Cliffs which combine to add even further interest to the area"
Castaways or shipwrecked mariners: In 1841 the Pers?v?rant, a French whaler, was wrecked on Dirk Hartog Island "The 25-man crew struggled to Cape Levillain, on the northern tip of the island, where they camped in the sandhills for ten weeks. Five men died of scurvy and are buried on the island, but the others sailed four whale boats on a treacherous ? and to some, fatal ? journey to Indonesia. Archaeologists have discovered brass buttons, glass, ceramics, clay pipes and other artefacts at this camp site." Holocene: Later, a rise in sea levels during the Holocene epoch (the most recent 10,000 years) flooded the region and created Shark Bay's unique double-basin form.